Lotus QuickPlace is the leading self-service Web tool for team collaboration. 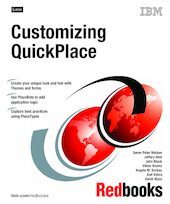 This IBM Redbooks publication is about how you as a Place owner, a Web designer, a programmer or a QuickPlace administrator can take QuickPlace to the next level through customization. Even though QuickPlace is a self-service tool, there will often be a need to integrate with other systems and we show how you can integrate with Notes, Domino, Domino.Doc document management, the Domino Workflow product and we also discuss how to integrate QuickPlace in a portal. Finally, we show how you can clone the Places you choose, together with their customization as PlaceTypes, and how to build a Turnkey server with your PlaceTypes and other customizations, for internal reuse or for resale. Many examples are included throughout the book.